Kolkata: A fire broke out today in a building of the state-run SSKM Hospital here, the main referral hospital of the state, and was doused after over an hour. All the 70 patients in the building were evacuated safely. 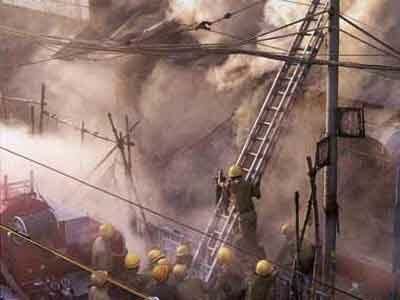 “The fire has been put out,” West Bengal Chief Minister Mamata Banerjee said after overseeing fire fighting operations at the hospital. “There is no report of any injury, all patients are safe,” she told newspersons at the hospital. The fire had started at around 11.00 AM inside a library in the sixth floor of Ronald Ross Building within the hospital complex in south Kolkata. “There were around 70 patients within that building and everyone has been evacuated safely,” city Mayor Sovan Chatterjee said. “No one has been trapped inside the building,” he said. Banerjee, whose Kalighat home is about two kilometres away from the hospital, rushed to SSKM soon after the fire broke out. Nineteen fire tenders were pressed into service to bring the blaze under control, fire brigade officials said. “Fire brigade officials will conduct an investigation into the cause of the fire to find out whether the blaze had been started by someone or whether it was an accident,” the chief minister said. Banerjee said that since SSKM is a big hospital, a permanent fire station would be set up by tomorrow within the complex with two fire tenders and a ladder.